The levels of estrogen and progesterone in a woman's body begin to decrease as she enters the menopause transition. Usually when people talk about menopause, they focus on estrogen decline, because researchers believe that it is declining estrogen levels that are responsible for many menopausal symptoms. Why Do Estrogen Levels Drop during Menopause? Estrogen is a hormone that is integral to the female body. When a woman reaches menopause, she is no longer able to reproduce, and she does not ovulate or have a monthly period. Estrogen levels drop because the body is no longer preparing for reproduction, which is one of the main functions of estrogen. However, estrogen plays a wide range of roles in the human body, and as estrogen declines, these functions can become disrupted. This explains menopausal symptoms such as hot flashes, night sweats, mood swings, and vaginal dryness. Menopause is a life stage, not a disease. Therefore, it does not need a "solution." Menopause also does not need to be diagnosed, and many women do not experience any menopausal symptoms. However, many women experience symptoms and side effects of menopause that they would like to treat to improve their quality of life. There is not a one-size-fits-all solution for menopausal symptoms. The most commonly prescribed treatment for menopause is hormone replacement therapy (HRT). 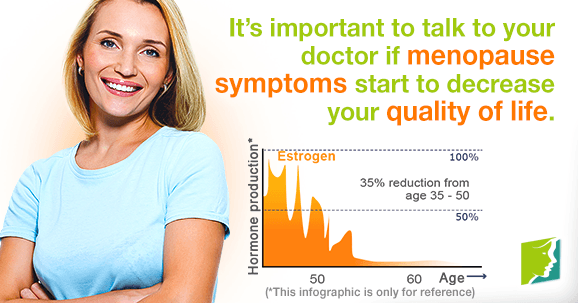 Hormone replacement therapy comes in different doses of estrogen and progesterone and has been shown to help provide relief to some of the major symptoms of menopause, such as hot flashes and vaginal dryness. HRT comes in different forms. For vaginal dryness, it is usually applied vaginally in the form of a cream or suppository. For hot flashes or a mixture of symptoms, HRT can be taken orally as a pill or applied as a patch. It is important to keep in mind that HRT can increase a woman's likelihood of developing certain diseases, such as breast cancer, heart disease, stroke, and blood clots. Talking to your doctor about whether or not hormone replacement is a good fit for you and what your risk factors are is vital. Although menopause is not a disease and it does not need to be diagnosed or treated, it can still be important to talk to your doctor if you are experiencing menopausal symptoms that are lowering your quality of life. Although some symptoms, such as hot flashes and mood swings, are often associated with menopause, menopause has a wide range of lesser known symptoms - including sleeplessness, dizziness, and electric shock sensation - that your doctor can help you work through. Click on following link to learn more about menopausal treatments.